For the most part it was good, however the furniture in the living room is very poor. Also consideration should be given to the living room layout, too much wasted space. This is the second year, and second time we have stayed in the Sea Turtle. It is beginning to feel like our second home. 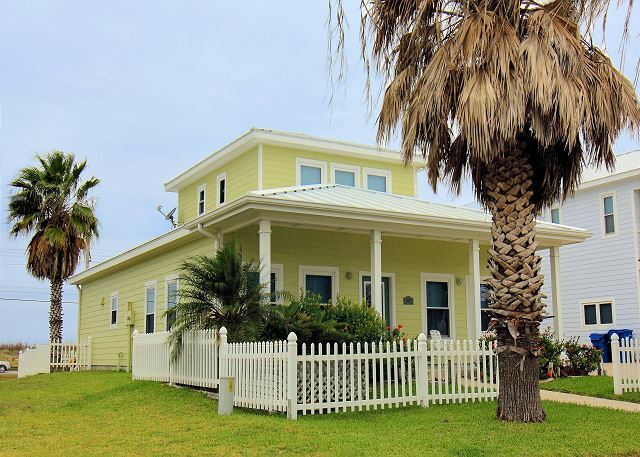 Comfortable, cute, and easy to rent from Port A Escapes. 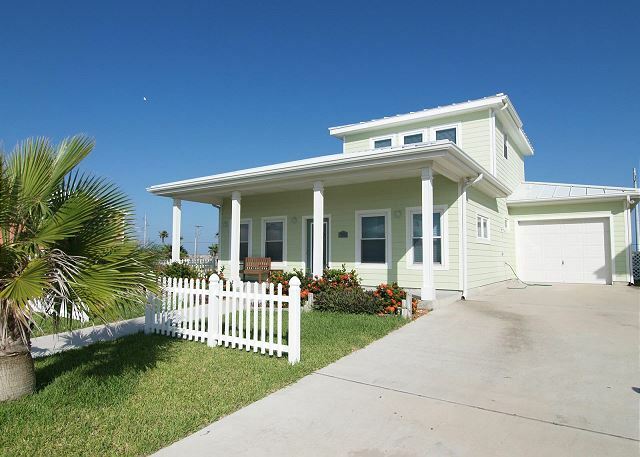 Good location with walking pier to the beach, wide enough for a golf cart if you choose. 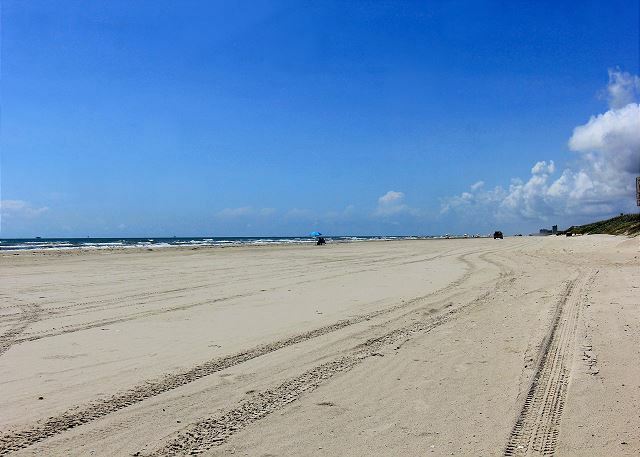 Prefer to drive and park on the beach? Just a mile up the road to beach access. Come mid June and you might see a sea turtle hatchling release at Malaquite Beach, a short drive south. Most Port A Restaraunt’s and businesses have reopened. They’d love to see you. Wonderful, just too short. Only wish is that the house wasn't backed up to the busy road. Very good. NO complaints, Will contact you again. 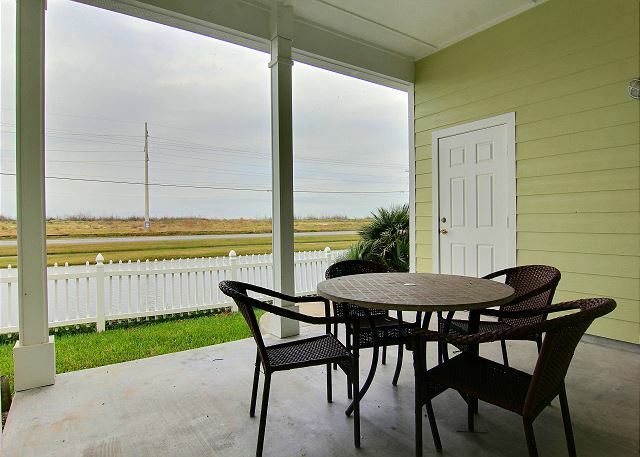 Nice 3 bedroom house in a small neighborhood on Hwy.361. Short drive into town. 2 convenient pools. 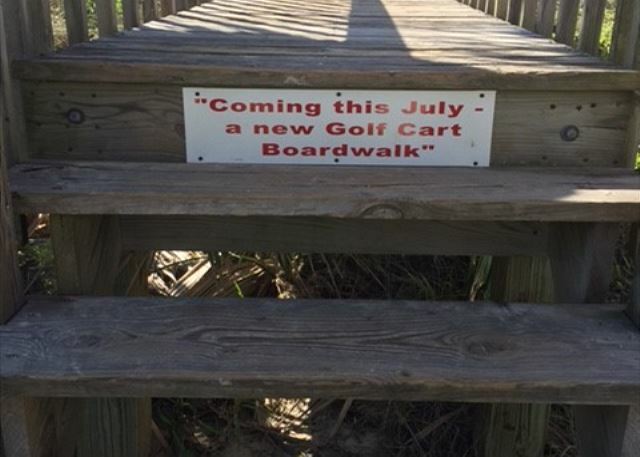 No beach access but will be available soon. 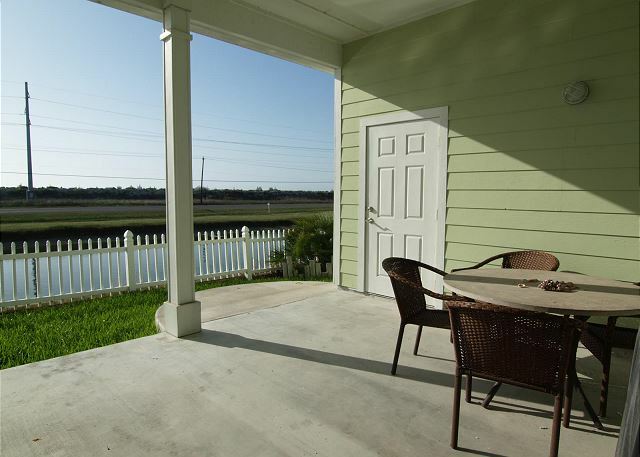 Property management company provided excellent, quick service. It was a great stay, very roomy, comfortable. It was two families and our stay was perfect. The Sea Turtle was just right for our family and after a day we referred to it as "OUR beach house"! We felt right at home the minute we opened the door. 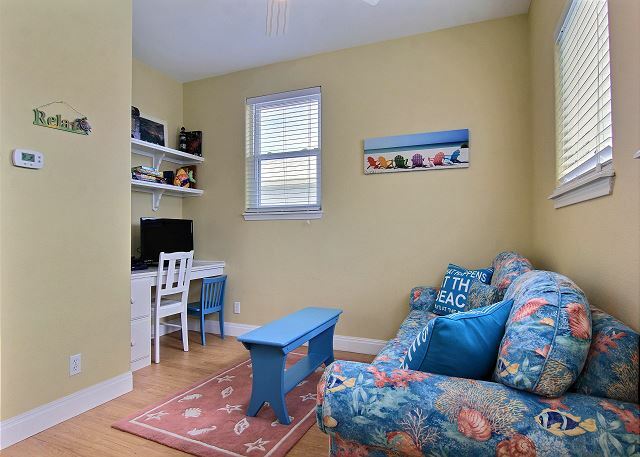 Convenient to the beach, the restaraunts uptown and the Natinsl Seahore down south (if you are lucky your stay might be during the annual sea turtles hatchling releases!). Away from the rowdy crowd. And Port A Escapes made it all easy. We'll be back! Home was great! Clean and plenty of room for three of us and our two doggies:-) Would definitely recommend it to friends. We drive to the beach each day and you can walk but it's a little bit of a hail when you have to carry things. Overall we had a great time and will be back!! Had a great time during our stay at the Sea Turtle. We would stay here again. The accommodations were amazing... Very clean and neat. Loved the closeness to both city and the beach. One of the most relaxing vacations. 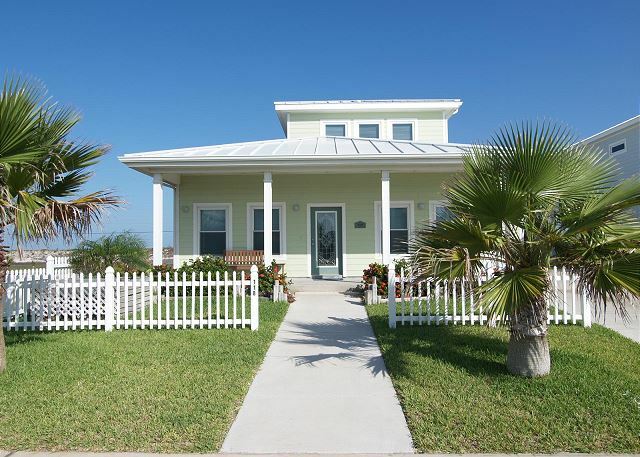 It was a great vacation, rental home was clean and very comfortable. Very nice, clean house. Good pool. Beach was a little longer walk than anticipated. Loved the gas grill. Couldn't find the bedding for the sofa roll away. But I never called about it either! Very quick and easy check in and out. The house was very clean It was everything we expected. Plenty of parking and a quiet neighborhood. Definitely would stay here again. We even caught a small perch off of the back porch. 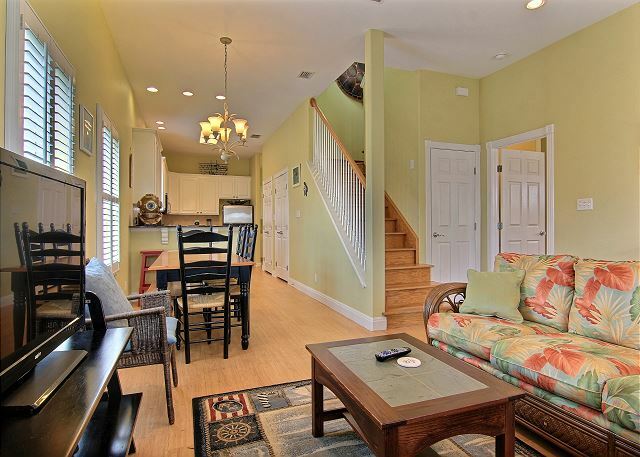 We had a fantastic family weekend at Sea Turtle 118FD in Royal Sands. The house was clean, in good condition, and reasonably well stocked with kitchen utensils, beds/linens, and shampoo/conditioner. The air conditioner, TV's, and washer/dryer all worked well. We had our puppy with us and the small backyard was PERFECT for frequent bathroom breaks. The walk to the beach is about 10-12 minutes, but, not a big deal. The house is next to the highway which was a bit noisy if you're outside, but, we had no issues with noise inside the house. Only MINOR constructive feedback would be to provide hangers in the closets, replace the master bedroom shower head, and provide directions for the dishwasher since the control buttons were worn off. I highly recommend this house for fun beach weekends. Thank you for your recent review. We have provided 12 nice hangers in each closet and have also changed out the shower head. Thank you for staying with us and we hope to see you again in the future. Great house overall. Condition was excellent. House was spotless. Minor maintenance issues were fixed promptly. Ground level living and bedrooms were perfect for our older dog. Two negatives for us were the road noise from Hwy 361 and the boardwalk was not handicap accessible for our older dog. Very nice house, clean, good amount of space downstairs and upstairs for the kids, good lighting at nite, safe and secure for the family! The house is a bit small but warm and cozy. 10 minutes walk to the beach isn't bad. I stayed in this house with my family this summer, we were very impressed. We stayed for 3 nights and came with several adults and 2 children. We checked in at 4pm (check in time) - we originally went to the wrong office (thanks google) but were quickly pointed in the right direction so it must happen a lot. Upon arrival everything was very clean & cute. The kids LOVED their bunk beds & they were very sturdy, I even slept on the top bunk (135 lbs) and had zero issues. We used the BBQ pit several times (bring your own charcoal!) - it was extremely rusted when we arrived but we cleaned it up and it worked just fine. The backyard does have a fence but in several places complete slats were missing in a row and it is raised above the ground (wouldn't keep any dogs in if you were bringing any). The backyard overlooks a small pond and the kids loved feeding the turtles/small minnows/birds from there. 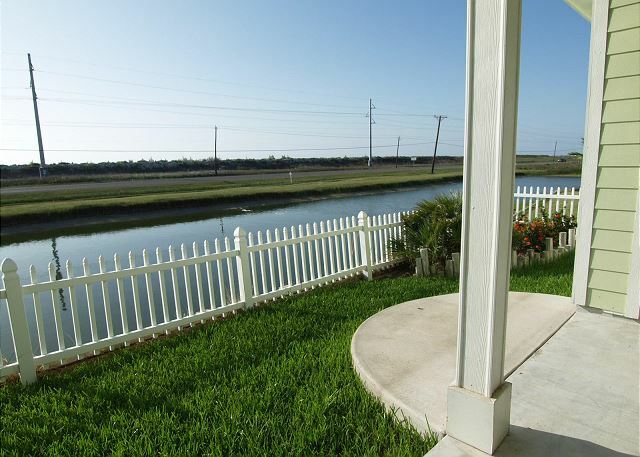 As for location, the house is located at the front of the neighborhood (furthest from the boardwalk) so it is about a 8 min walk to the boardwalk and then a 5 min walk on the boardwalk to the beach. There are 4 parking spaces at the boardwalk so we did that when we had beach toys/chairs. We went at several times of the day and never had an issue with parking. 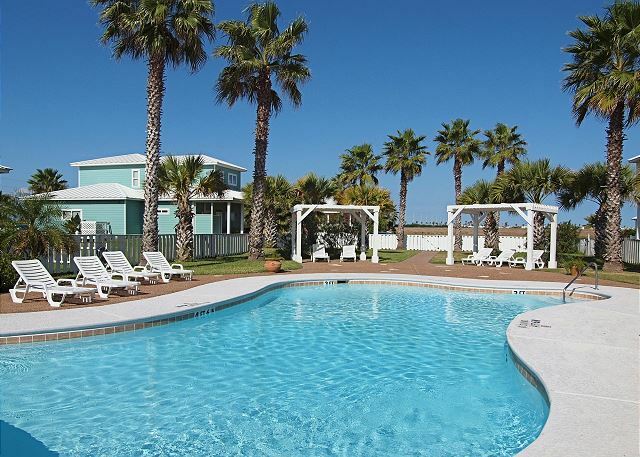 There are two pools, one right across the street so maybe a 1 min walk, super convenient!! Technological issue: the outlets in the upstairs living area (with the pullout) did not work, minor inconvenience. As for parking, we fit 3 cars in the driveway no problem. All in all we LOVED staying here and will definitely be back. It has everything you need for a great family vacation. Great property. Everything was as advertised. We'll be back. My family and I had such a wonderful time! The home had everything we needed. It was beautiful and very cozy! We would definitely rent again. 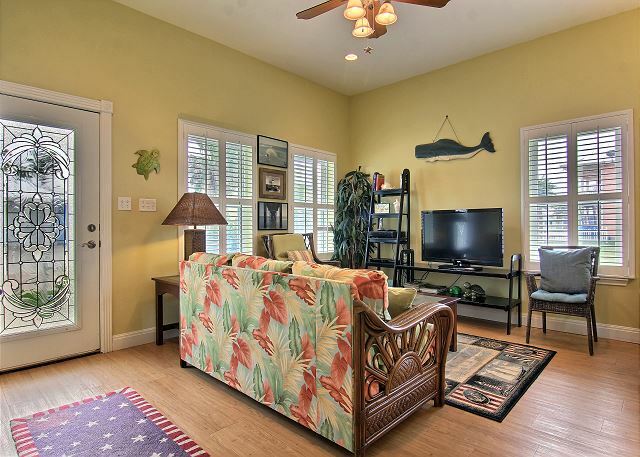 We stayed at the Sea Turtle, which had a great floor plan with plenty of room for two families. The only issue we had was with the ants. Tons of ants everywhere; kitchen, pantry, bathrooms. But that didn't lessen our experience of the place. I recommend the Royal Sands development. Just make sure property management sprays for ants! 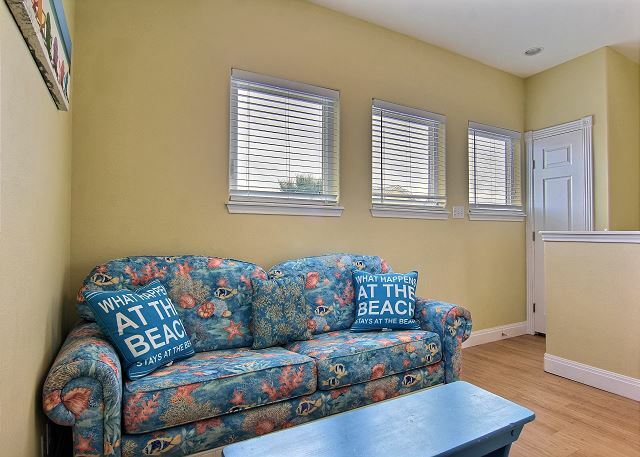 - The neighborhood is quiet, backs to the beach (connected to the beach with a boardwalk), clean, and made up of similar homes. - The house us modern, clean, and well-kept. - The only suggested improvement would be to have an internet connection. There's a wi-fi connection, but it doesn't give access to the internet. Thank you for your review. We have since upgraded the internet and it runs at a super fast speed. We hope to see you again in the future. 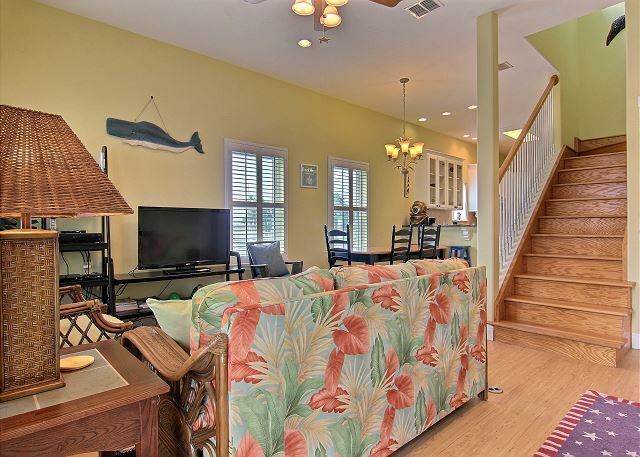 Once again, this home provided a great place for three generations of family members to enjoy a week of perfect beach fun. Cold weather could have used more blankets. Furniture very uncomfortable. Other than that we have been coming for five years best rental yet!! Perfect, only opportunity would be to have a note on the dishwasher and stovetop as to what buttons to press, as all the words are rubbed off and we didn't know how to use them! We recently stayed at the Sea Turtle Property with a total of 7 guest and 1 dog. The house was large and spacious for enough room for everyone to move about. 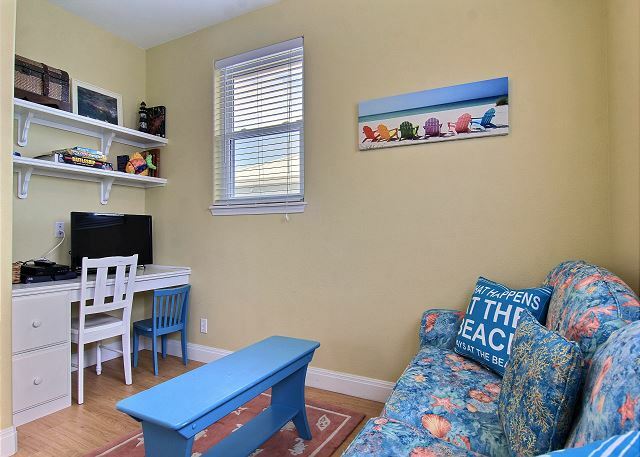 Location was ideal to the beach, we could walk down the street to the boardwalk or drive a short distance to the access road. Both ways were easily assessable. The only issue that we had with the property was the fridge was not cold and had frozen over. We let the management company know immediately and had a repair person at the property within an hour. 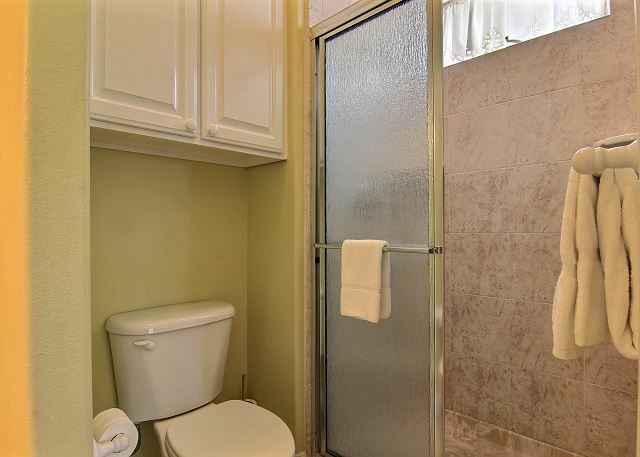 Overall, very pleasant experience and would recommend this property to anyone. The furniture in the living area was not very comfortable. But the kitchen and bedrooms were outstanding. The beds were very comfortable, and everything was super clean. It was a long walk to the beach area though it was accessible. Look forward to returning ASAP. 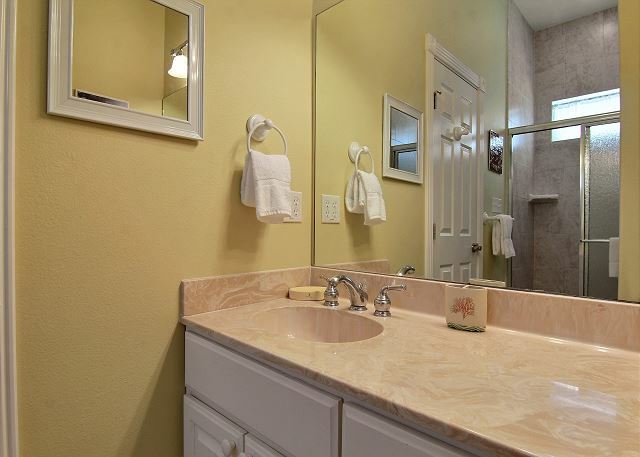 a guest from San MArcos, Tx does not recommend this vacation rental. We had a wonderful time and met lots of great people in Port A. The house was lovely and well stocked and the office staff were very nice and helpful. My only complaints were the lack of 21st Century technology. There was a router in the house, but no internet access; the phones occassionly rang and they were blinking and lighting up a lot during our stay which was annoying (so we unplugged them);only one TV with DTV and a gas grill would have been nice. The only reason I would not reccommend this house is that it backed up to the road which was well travelled 24/7 and a little noisy. But with that said my quests and I did enjoy ourselves in spite of these few minor things and actually one group made a sport of counting the cars going by on 361. Thanks to all. Perfect winter getaway for anyone that wants to bring the whole family and not leave the furry ones behind. 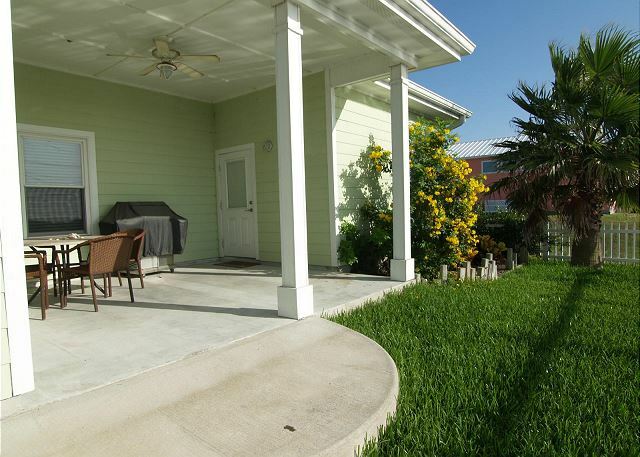 Super short drive to the golf course and just a bike ride or healthy walk from the beach. A good time was had by all. This house was wonderful! It was well equipped and spotless. I would like to suggest to the owner to get Wi-fi. It was really inconvient to have to drive to town to find Wi-fi and at this price level I would think it would be included. Perhaps it was there and we just did not know how to activate it so in that case instructions would be nice. Also none of the TV's in the bedrooms worked and again for this price I would have expected them to. The only working TV was the living room. The other draw back was beach access. 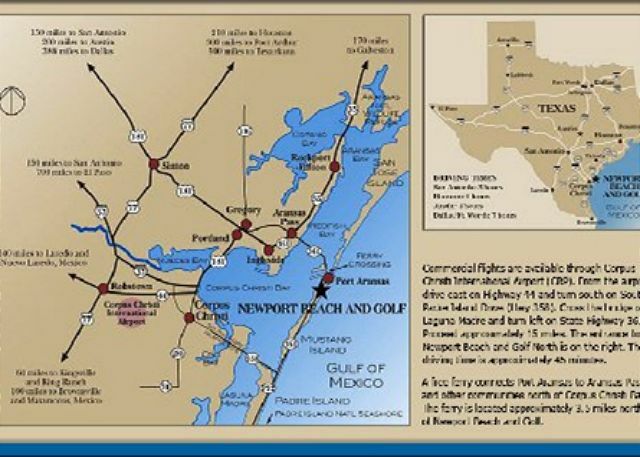 We could not drive a golf cart on the highway and we had to take the truck to the beach or on foot it was a long walk. I loved that we could take our dog though. It is hard to find places this nice that will take your animal. I have a 2 lb yorkie who travels in a handbag and has a play pen but it was still considered a an animal. The last thing I have to say is my childs grandfather drove in from Houston and arrived at 5 am and did not want to disturb anyone at that hour so parked his truck outside to read the paper and cat nap and he was startled at 5:30 by a gentleman knocking on his window telling him it was illegal for him to do these things, so watch those rules. They are uber enforced. All in all though it was a lovely house and a lovely stay. Just minor inconviences. 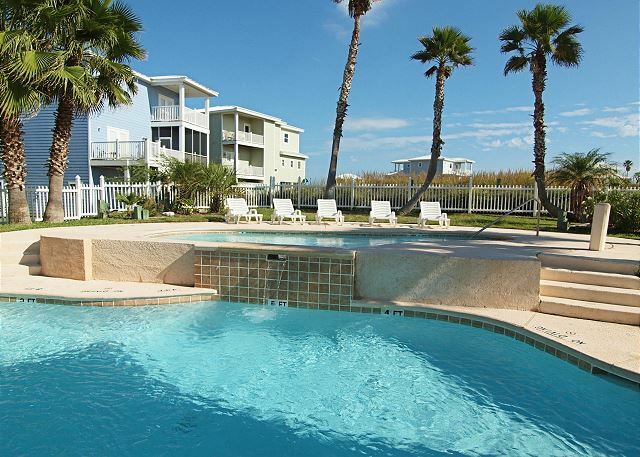 What a wonderful vacation rental,we loved it could not find anything to complain about here.When we come we prefer ocean front rentals,but were unable to find pet friendly on such short notice,but would stay here again. Overall, my 8 girlfriends and I loved staying here! 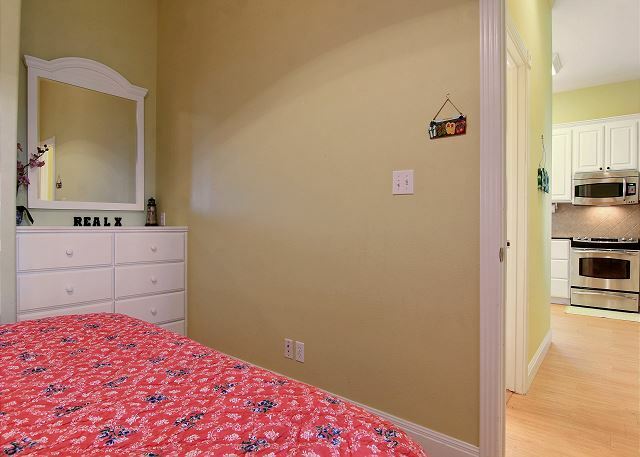 It would have been nice if there were more than one tiny mirror in the upstairs bathroom/loft area. It would have made getting ready easier with 9 women in the house! The house was very clean, although we did have to remove a few cobwebs and some ants in the laundry room. We expected some road noise as the house backs up to the road, but it actually woke us up in the morning which became annoying. 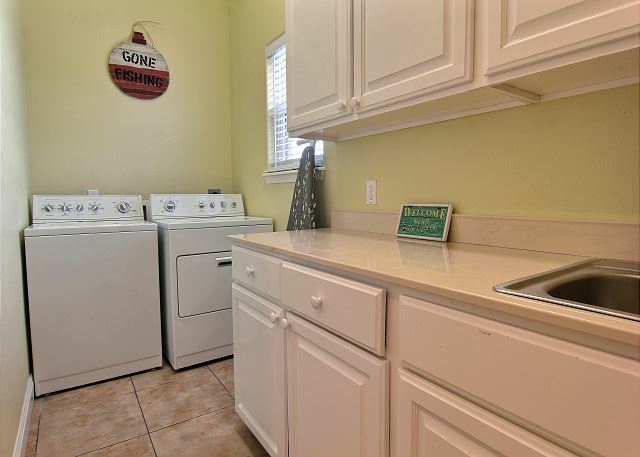 The owners may consider adding a few more kitchen gadgets, such as a pair of potholders to make it easier for guests. Overall, we enjoyed our stay at the Sea Turtle! It would have been nice to know that the fan was disabled in the upstairs bunk room for safety purposes before we waited for someone to come repair it. Being right next to the main highway made sitting on the back porch next to impossible due to the traffic noise. 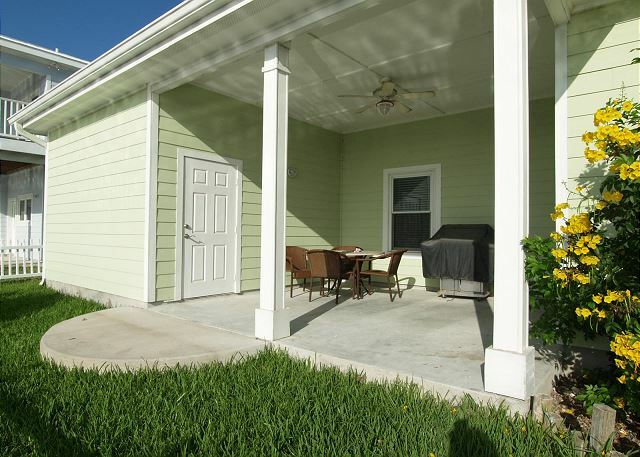 It would have been nice to have more seating on the front porch where the breezes flow. We had 5 people there and had a great time because we spent most of our time on the beach and at the pool. Overall very nice and clean. Kitchen has everything you will need. Take a blow up mattress because the fold out couch is bad. The pool chemicals need to be maintained daily. Chlorine was always low. We slept ten very comfortably and the kitchen had everything we needed for all of our meals. 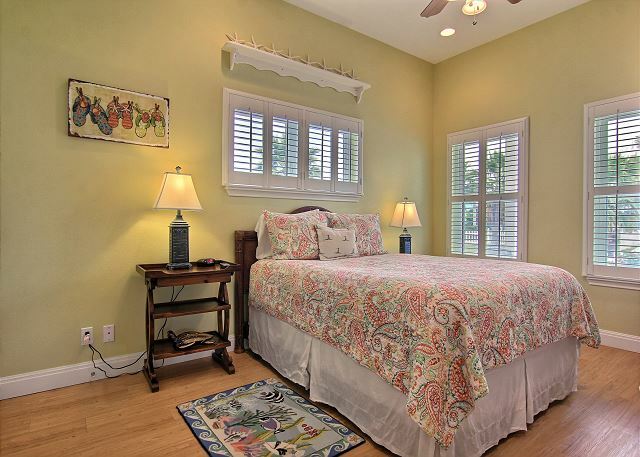 We loved the ability to bring our dogs and the master bedroom had the most comfortable bed ever! 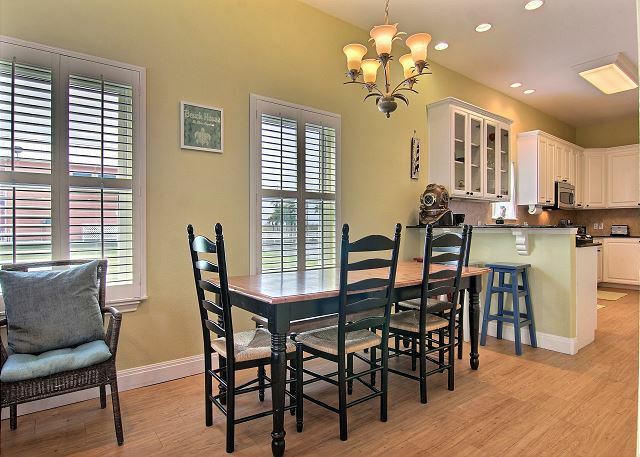 Late arrival was easy and the house is adorable and clean. The grill was too small to grill for ten each night. We would stay here again for sure! We were initially disappointed that the property backs to Highway 361. 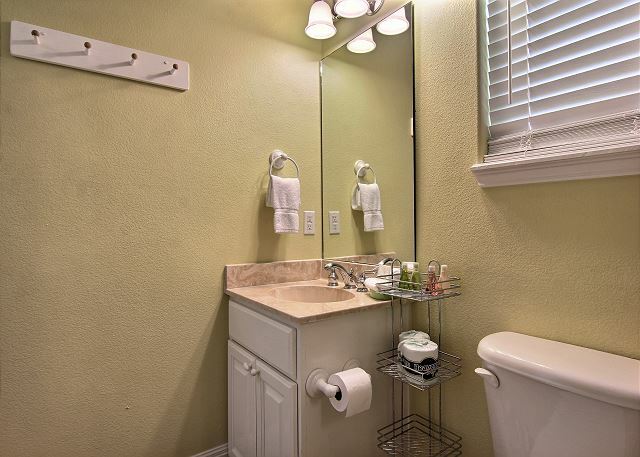 However, that does not affect the inside of the property and it was otherwise perfect for our needs. 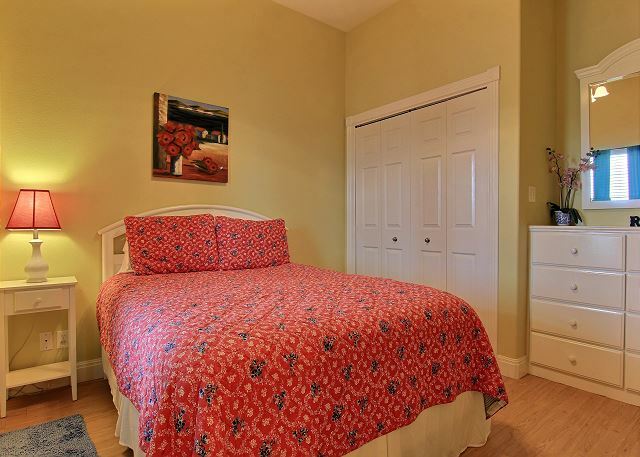 It was also decorated with a very "homey" feel -- adding to the comfort of our stay. 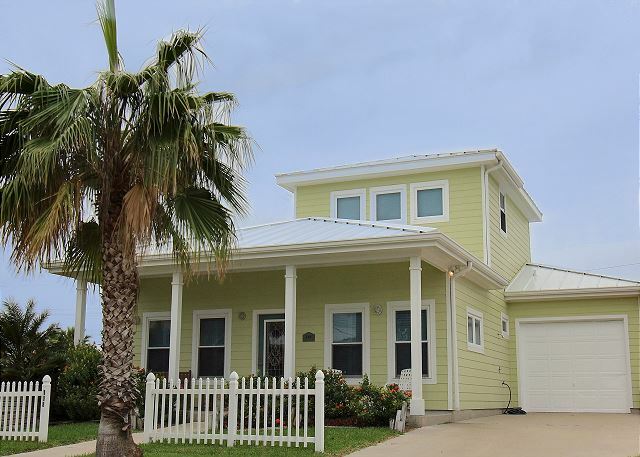 This was my family's first trip to Port Aransas and we will not only return, but would be willing to stay in Sea Turtle again! This was a wonderful house for a 2 families with children. 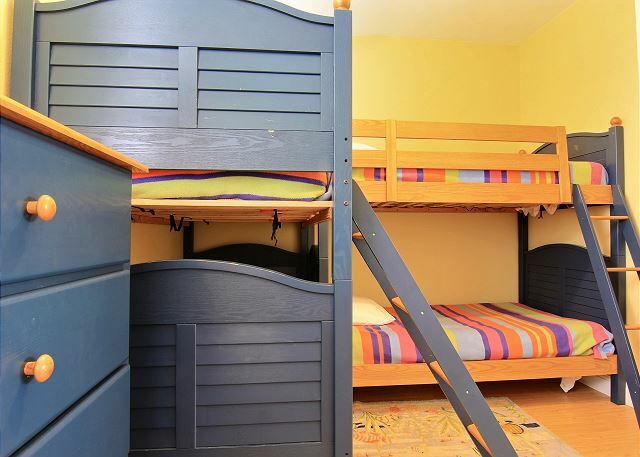 The children have the upstaris with a bedrooms with 4 bunk beds and a small TV room. 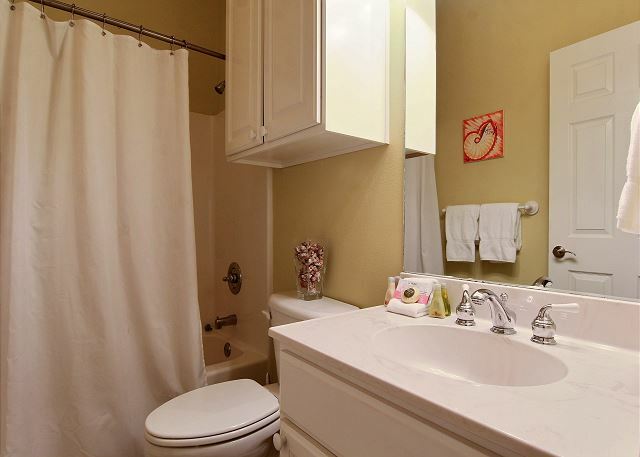 Downstairs are 2 master bedrooms with 2 baths and a great kitchen. We just spent Father's Day weekend at Sea Turtle and loved it! 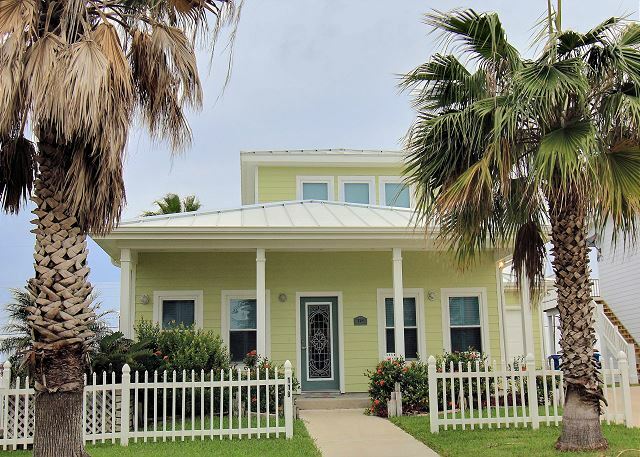 It was our first time goingbto Port Aransas and this house was just perfect. We went with our two kids, two of their pals and our two mini schnauzers. 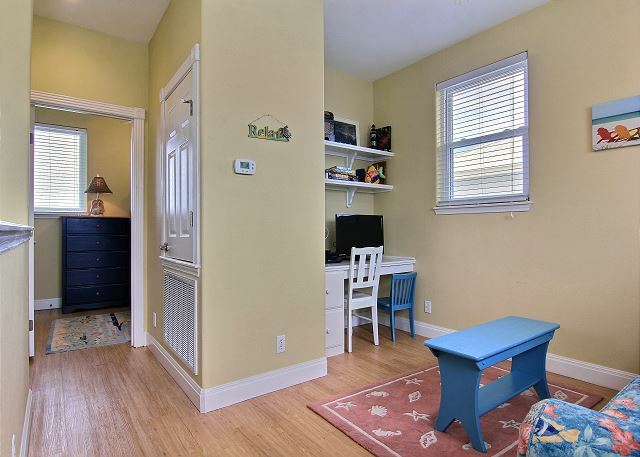 We were very pleasantly surprised by the home's layout. The floor plan was great for our family. The kids loved the upstairs area and all the full bathrooms were a blessing! 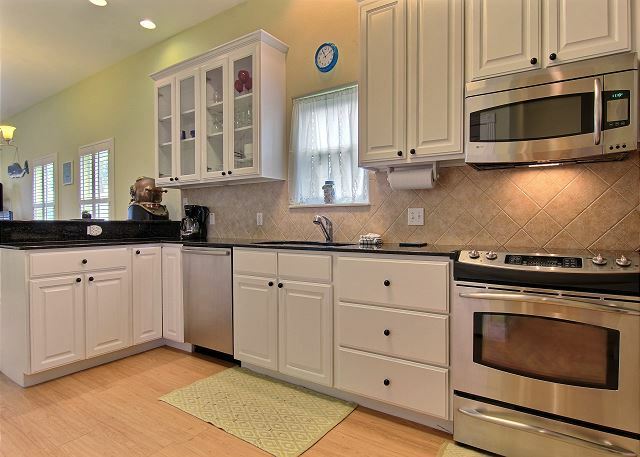 The kitchen was very nice and very well maintained. Everything was clean and neat. Although the back porch faces rt.361, it hardly affected our stay. The house and windows are very well insulated and we never heard any traffic noise at all. The development was very well situated and the drive from the restaurants and the "town center" was perfect- Just under 5 mins to the main areas. We walked to the beach twice a day and it was an enjoyable walk, as the other homes in Royal Sands are pretty to look at and well maintained. We loved the beach!! It felt very private and secluded, even on the weekend! The beach was clean and the water was warm. We did not have many problems with the sea weed. On our daily beach walks, near and far from Sea Turtle we noticed a couple of jellyfish on the sand. Be aware that they still have poison on their tentacles even if their are dead. Their numbers are Not enough to be a nuisance or concern, but if you have curious little ones with e you- let them know not to touch! Overall, we were very happy our stay at Sea Turtle, and we will definitely be going back! 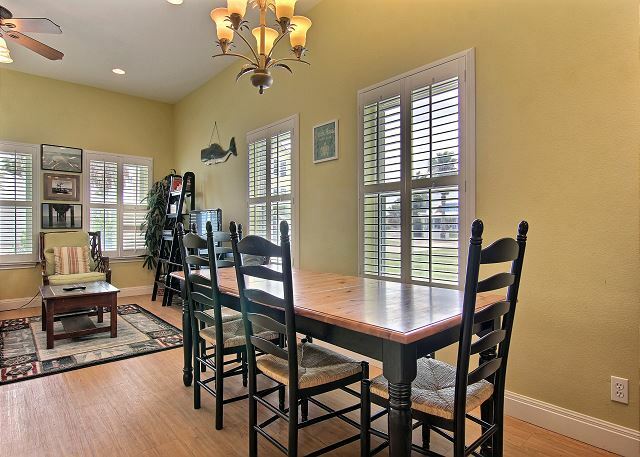 The house was very nice and comfortable, great for two couples with kids. Beach access was very close driving distance and the neighborhood was very quiet. Great place to relax. The only issue was the small waterways running through the neighbprhood attracts alot of mosquitos, Doesnt take away from a beautiful n clean home. Overall, a nice place to stay. Generally, this property was very nice. Advice to pass along is: Control the ants on the back porch, leave more trash bags, leave rinse aid for the dishwasher, and it would be nice to have access to the garage to store beach chairs, bikes, etc. The oven didn't heat very well and the cook top heated unevenly. Also, we had to buy hand soap for the kitchen. We would stay here again. Very nice. Everything went as planed. Good Experiance. We spend the Christmas holidays with all our family at this cozy house on the island. 4 adults and three children. It was perfect and very roomy for all of us. 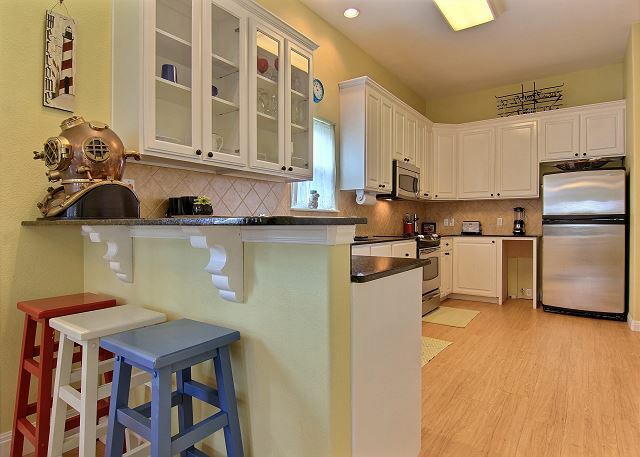 I especially loved the large open kitchen. We all work together with the cooking so it went beautifully. It was a fun time for everyone. 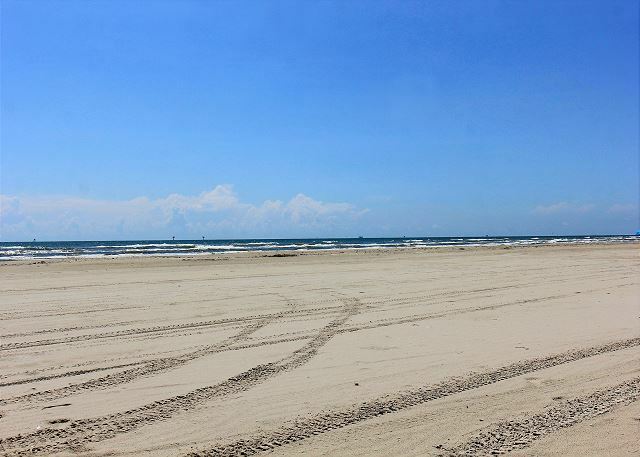 I took my family down to port a for a weeks stay. The house we stayed in was perfect. We enjoyed it immensely. The master room, kitchen and patio were great. 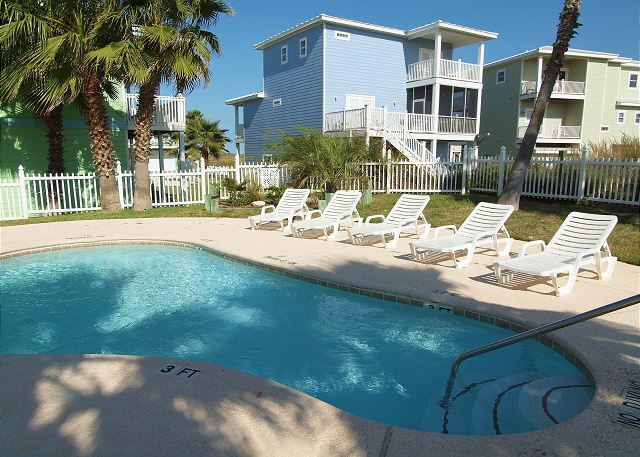 We vacation twice a year in Port A and we will definitely look to stay here again. Great beach house. Modern and clean. Easy trek to the beach. The house was great. The location to the beach was a little farther than I expected with the description in online. The location to shopping and downtown was great. The pool was disappointing. We have stayed at other rental properties that had a much more upgraded pool and more little-kid friendly. 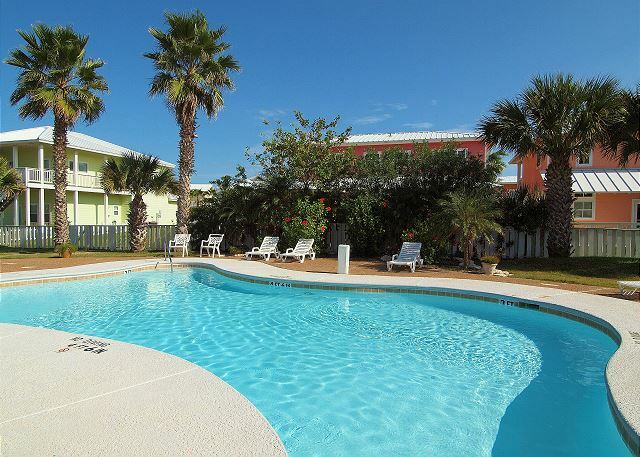 We will likely choose another rental property next time just due to the pool. 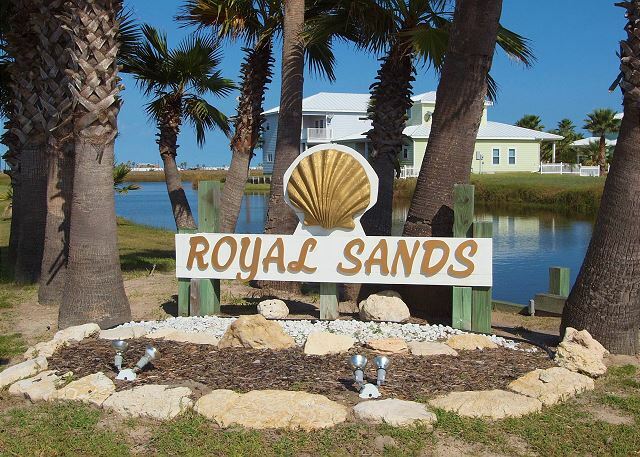 Overall our family had a wonderful stay at Royal Sands Sea Turtle beach house. The accommodations are nice, good floor plan, and the house had just about everything we needed. Only problem that was a nuisance were the ants inside the house. (I informed rental agency). 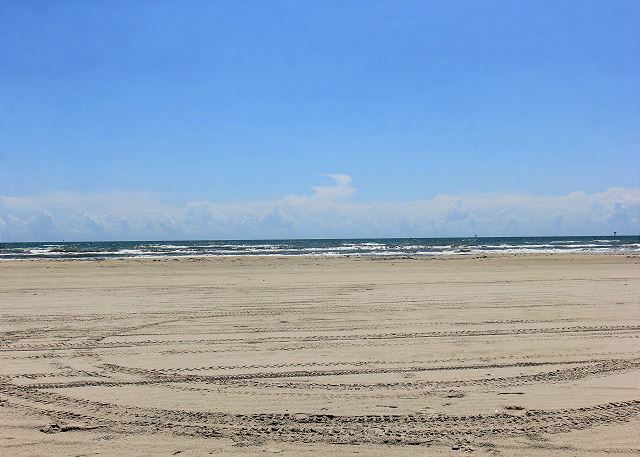 The distance to the beach is fine to walk as long as you aren't carrying chairs, drink cooler, beach bag and umbrella. There are a few parking spots in the neighborhood by the boardwalk, but then there are several sets of steps to navigate up and down on the boardwalk (We paid for a beach pass and drove). Both neighborhood pools were green the entire 5 nights we were never used them. We would stay here again. 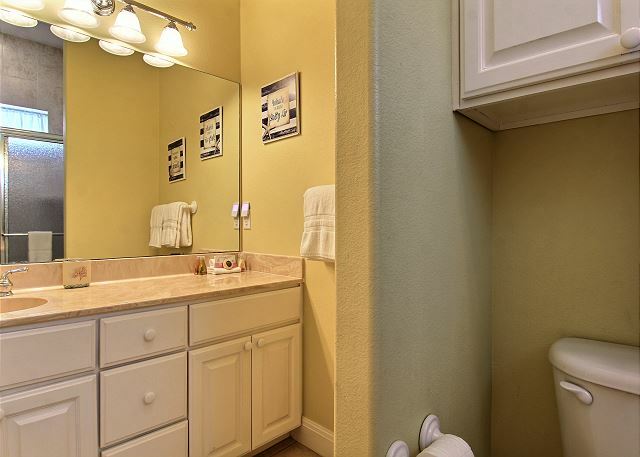 My experience is that the rental agency needs to be more aware of amenities of rentals. The Sea Turtle was very clean and smelled clean. The kitchen had everythig we needed and the cookware was in very good condition. The bed in the master bedroom was very comfortable. While the walk to the beach was a little far (10 min walk), we would stay in this house again. 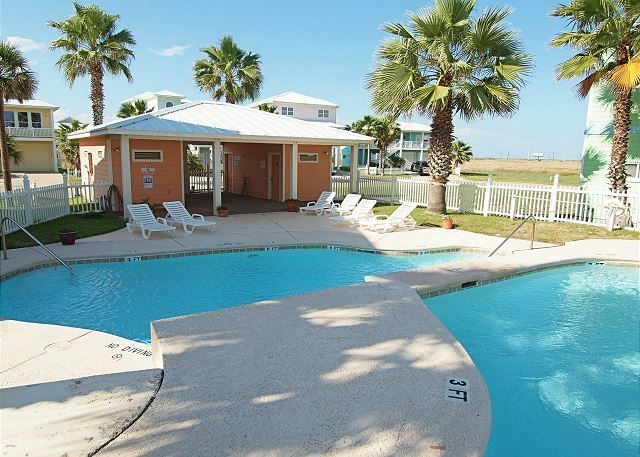 Very clean, easy access to beach, all cooking hardware was available, recommend highly. The community was very nice with a short walk to the beach. This house was a great place to stay. The house was great, very nice and clean. Our kids loved riding their bikes up to the boardwalk to the beach and around the neighborhood!!! 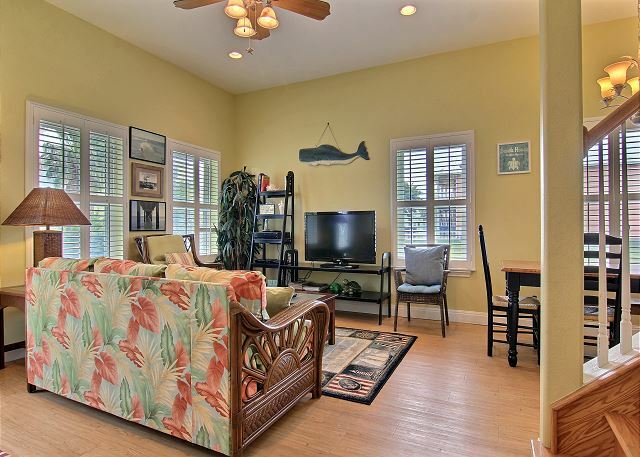 The house itself was absolutely everything a vacationer with a large family could ask for. The house is absolutely beautiful and had all the amenities needed to accomodate us in all aspects. The only complaint that we have is the pool near the house. It was not clean/maintained. The bottom was discolored and after talking with others who were staying in the subdivision and had stayed before, it appears that the pool is always this way. Other than this pool, it was a wonderful experience. Sea Turtle was all you could ever want. We stayed for 3 nights at the lovely Sea Turtle house. From the moment you walk in, you just start smiling. 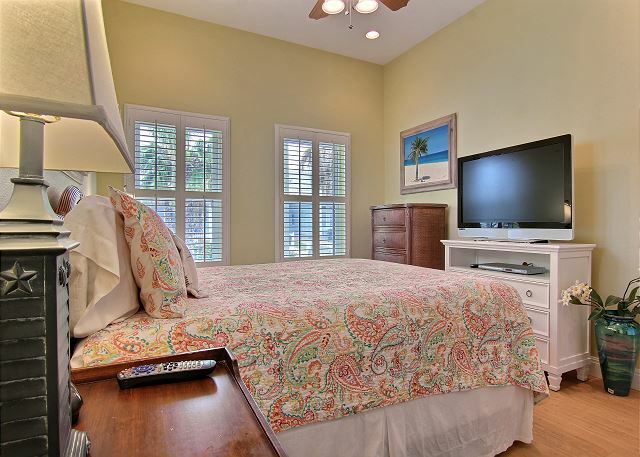 Nice furniture, huge TV, well stocked kitchen, beautiful bedrooms with cute linens. We used the washing machine to wash our sandy swimsuits and sprayed off our car and feet with the hose that was located near the doorway. Showers had good water pressure and althought the house is near HWY 361, did not hear the street noise. Used pool to rinse off after the beach, little bit crowded with small children and their parents. Parking was good for the three cars that stayed at the house, some houses in this area have poor parking, but not at the turtle. Would stay again in future. I have stayed at Port Royal, Mustang Royal, Village Walk and Coral Cay in the past and the Sea Turtle outshines all the rest. This house appears small but was perfect size for all 10 of us. 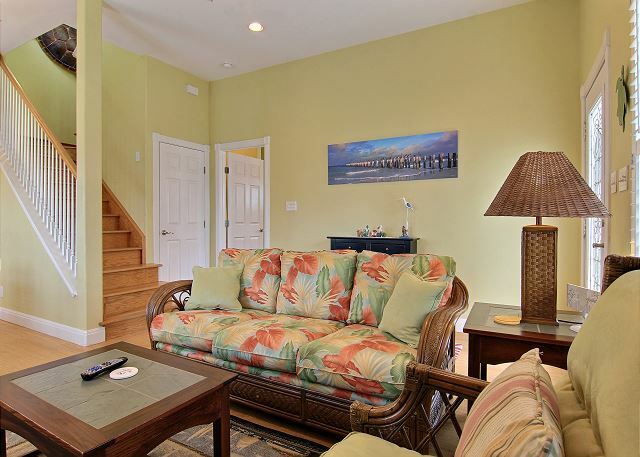 Perfectly located next to the pool and not too far from the beach. House was clean and everything worked. The entire family loved the house and we will be back! 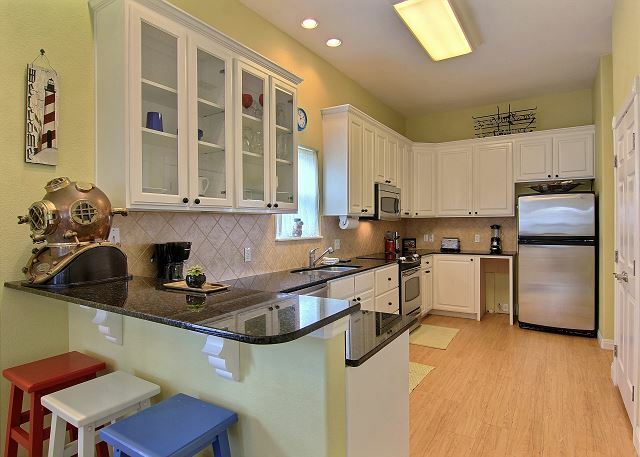 Cute beach house with a great kitchen! This would be a great cottage for two couples with kids. 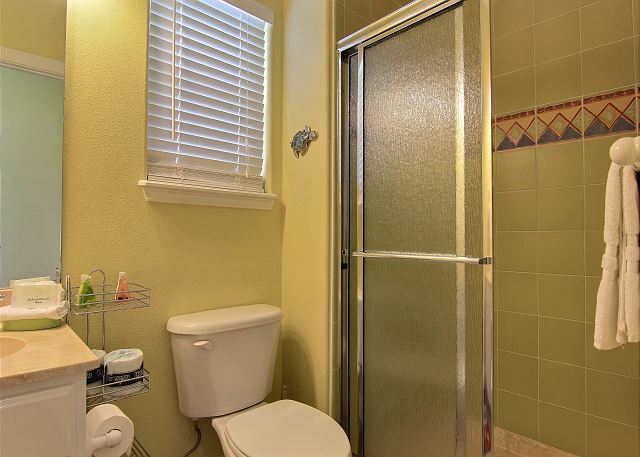 There are two bedrooms downstairs, each with its own bath. 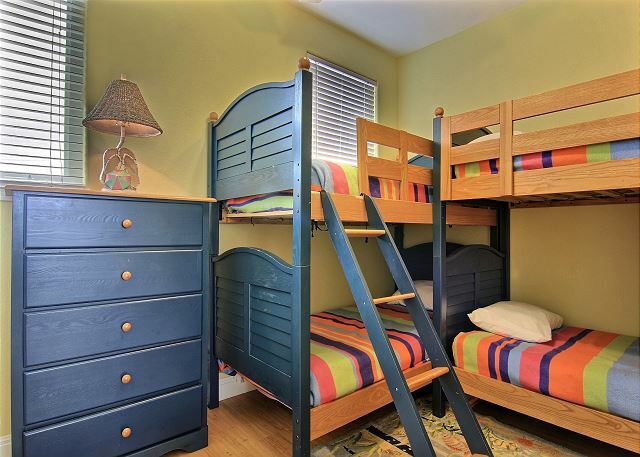 The kids can all be upstairs - one room is full of bunkbeds, the other has a pull-out couch (although its mattress is almost non-existent). 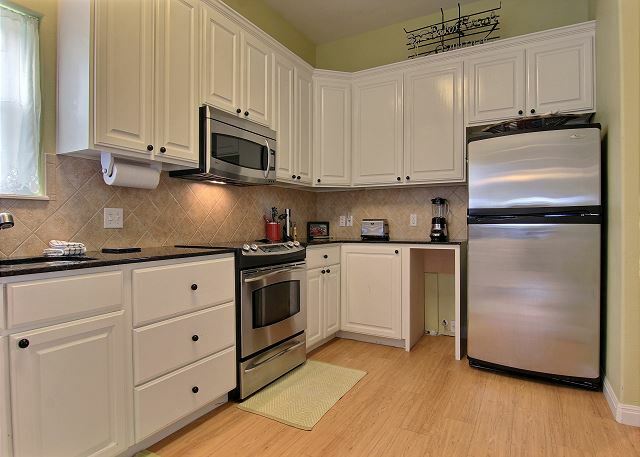 For those who like to cook - the kitchen is perfect. We really liked this cottage! 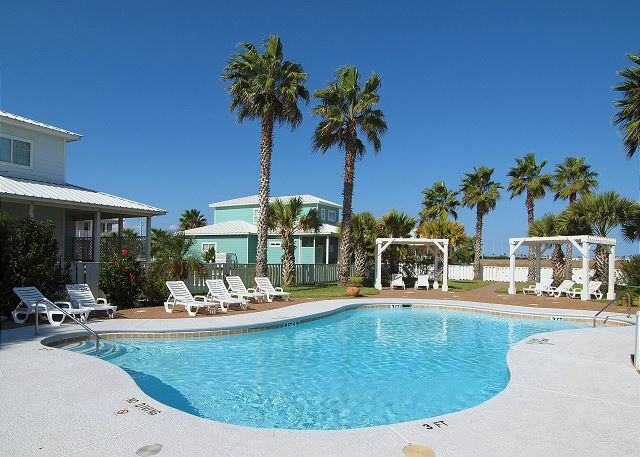 We had a wonderful time staying in Royal Sands and Port Aransas Escapes couldn't have been more helpful when making our reservation. I would definitely recommend this location (sub-division) and will stay again! I was disappointed with the grill that was sent over to replace the missing grill. They brought a small Weber and for 10 guests, it was a challenge to BBQ. The kitchen was stocked better than any I have ever stayed at. The appliances were great. 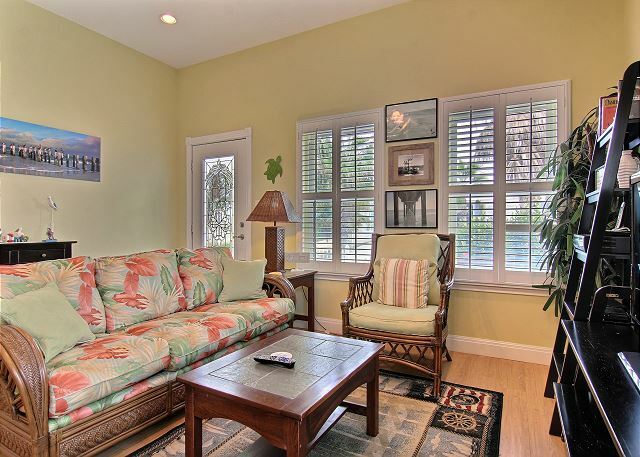 The house is homey and comfortable and very nicely furnished. 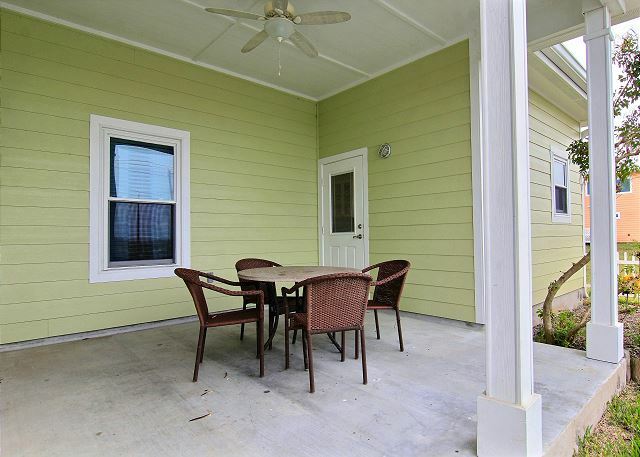 Overall, it was a great property! Sea Turtle is nice. Location of Sea Turtle not so much. We really enjoyed staying at the Sea Turtle over the 2009 Christmas vacation. It was in excellent condition. The only complaint we have is that there was no indication that this house was right on Hwy 361. Lots of road noise and a long way to the beach. Otherwise, it was a great find. 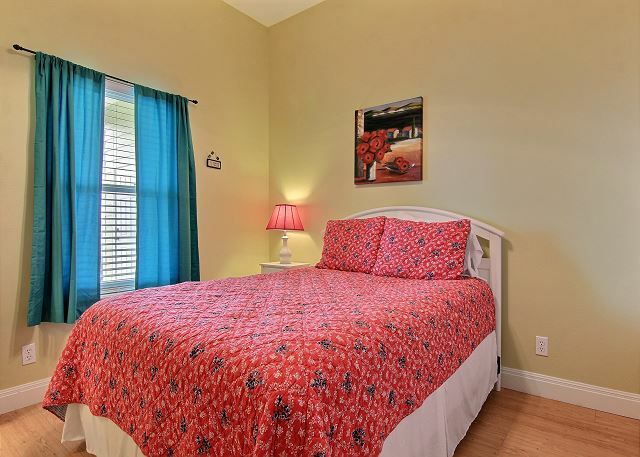 The home is beautifully decorated & all the bathrooms, oven, stove, garbage disposal, T.V. 's etc... were in good working order when we arrived. My only complaints are the road noise from the highway behind the house & no Gulf or beach view. I would stay there again but for a lower rental amount, or off peak period. We loved our getaway and the Sea Turtle was a great part of our enjoyment. Everything was handled very well by the Port A staff. We were truly pleased with the accommodations. The only complaint we had is that the floors were a little dirty in the main living room. Not unacceptable, just a bit of build up under the couch, where our 4 year old kept losing things! But we will definitely come back for our next beach getaway... Thanks!